When Akio Toyoda took over the top job at Toyota few years ago, he had a goal to transform his company. He wanted Toyota to be known for more than just its successful Camry sedan. He had a vision to change the entire lineup to reflect his passion for racing and bring more exciting contemporary styling to Toyota cars. 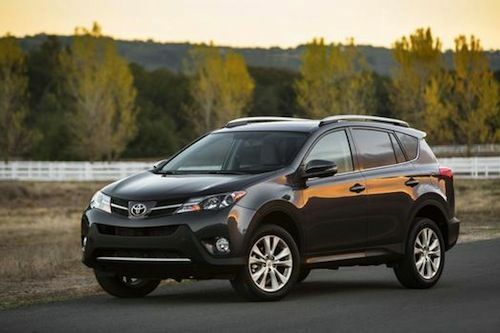 We can see his vision in the new 2013 Toyota RAV4 with its new dynamic exterior features. The previous generation RAV4 had a functional design, but need to be changed to reflect Toyoda’s goal to bring a new progressive look to the lineup. The new RAV4's design achieves what Toyoda is trying to do at the large global automaker. The fourth-generation RAV4 gets more aggressive styling with a sleek-sloping roofline and aggressively sculpted front and rear fenders. Contemporary buyers are looking for more than just a functional design and want something that has a fun character. Toyota has definitely moved the new 2013 RAV4 in that direction. The new front and rear fenders along with the low hood, the arc of the roofline and boldly proportioned taillights give the new RAV4 a much more athletic presence. Toyota engineers made a dramatic switch and a “significant break with its heritage,” by changing the side-hinged rear door to a convenient roof-hinged liftgate with a space-saver spare tire stored under the cargo floor. And another first for the next-generation RAV4 will be a one-touch power rear liftgate with driver-selectable memory height settings that will come standard on the Limited grade model. The new exterior design also affects the interior dimensions of the 2013 model and the cargo area is deeper, larger and easier to access than in the previous generation. The cargo capacity now features just over 38.4 cu. ft. of cargo behind the rear seats. With rear seats folded, RAV4 has class-leading maximum cargo capacity of 73.4 cu. ft.
As automakers try to squeeze the most fuel-mileage out of their new cars, they are doing it with more aerodynamic exterior designs. In keeping with Akio Toyoda’s new design philosophy, engineers paid special attention to the aerodynamics of the 2013 RAV4. We can see it in the small vortex generators that have been molded into the taillight cases and also near the base of the A-pillars. Engineers also designed aerodynamic undertrays beneath the passenger cabin that help smooth and control airflow. Aesthetically, the new SUV is visually appealing with the new halogen headlights with projector low beams and give RAV4 a more modern look. RAV4 XLE and Limited feature standard fog lamps that complement RAV4’s front architecture. In the rear, a roof spoiler not only visually extends the arc of the roofline, enhancing RAV4’s aerodynamics, but incorporates a brilliant LED center brake light. Underneath, Toyota engineers use a new high-strength steel that provides a stiffer platform to enhance steering and handling. Buyers can choose nine exterior color shades that include: Blizzard Pearl, Super White, Classic Silver Metallic, Magnetic Gray Metallic, Black, Barcelona Red Metallic, Pyrite Mica, Spruce Mica, and Shoreline Blue Pearl. Akio Toyoda’s design goals can be seen in the new 2013 Toyota RAV4 and he needed to make changes to keep up with the competition. Time will tell if RAV4 will be able to keep up with the all-new 2014 Subaru Forester that is already exceeding sales expectations. Look for the new 2013 RAV4 to arrive in showrooms in January.